A work in progress: EZ 100th Anniversary Pi Shawl: Camping (half circler version). I'm currently working on the "Slanting Twigs" section - row 67, with many more rows remaining to knit. I've always wanted to knit an Elizabeth Zimmerman Pi Shawl, but I'm not keen on full circle shawls, nor do I want to knit one until I'm 80. When I found the Anniversary Shawl patterns on Ravelry, I quickly downloaded the one I like the best: Camping. Notes from Ravelry: Elizabeth Zimmermann was born on August 9th, 1910 (8/9/10), so this year 2010 is the 100th anniversary of her birth. This shawl is one of a set of SIX shawls designed as a tribute to EZ and a celebration of all she has done for us. They are based on her PI Shawl which can be found in her book Knitter’s Almanac. 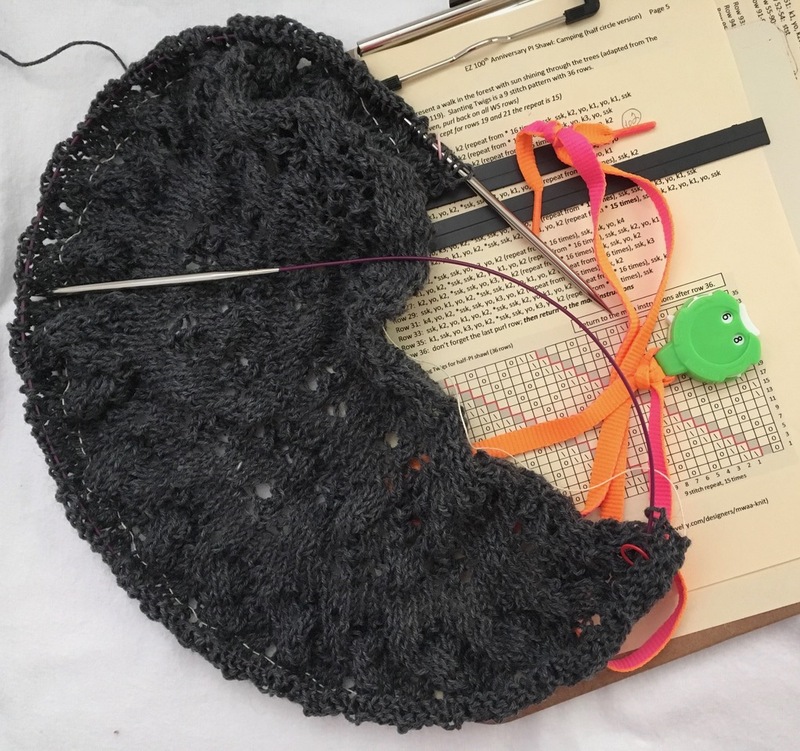 Three of the EZ 100th Anniversary PI Shawls (Gull Wings, Hearts, and Camping), are full circles; modifications have been applied so that the lace design stitch repeats and the number of rounds are multiples of 8, 9, and 10 (the numbers in her birthday). The other three shawls are half-circle versions of Gull Wings, Hearts, and Camping. Have you knit an Elizabeth Zimmerman Pi Shawl? I like the *idea* of knitting shawls, but when I finish them I NEVER wear them. So ..........no. No EZ for me. Yours looks like it is going to be stunning! I have not. I've been intrigued with the Pi Shawl, but like you, I'm not keen on full circle shawls...and I did not know there are half circle versions. Now I need to go look at those patterns! No, I have never Knit a Pi Shawl. I have found them fascinating, but didn't think I would wear them. Now that I've made a few shawls lately and have found that I actually enjoy wearing them, maybe someday I will try it. Like you though, I think I would go for the half circle version. I have not. I admire her and everyone who creates her beautiful shawls. Oh my goodness YOurs is going to be delicate and beautiful . I've only made a couple of EZ surprise baby sweaters, but I may have to check out one of those half pi shawls. EZ was just a bit older than my dad who was also born in 1910; EZ lived in the same town for a while also. It has been years since I knit a Pi and I think it's about time I did another one. I still wear the first one. Zimmerman's designs were the best!! I have knit a couple but I do like the half circle ones better. You will love this knit! Posts will be infrequent for a bit. . .